The 2016 TORI Award winning resumes are now online for viewing! Identify top resume writers to assist you in your career transition. View dynamic content and layout in effective application. Better understand what employers are looking for and what’s possible to stand out from the crowd. Gain ideas for creating and improving your resumes. 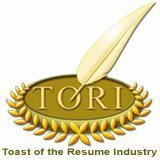 Resume writers: The 2017 TORIs are now open for registration. You can learn more here.